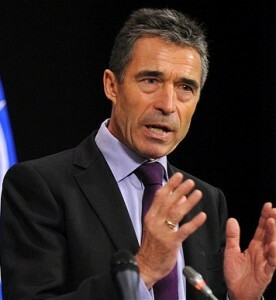 Sofia, April 12 - NATO Secretary General Anders Fogh Rasmussen Friday pledged to strengthen the shield along the border with Russia, and urged allies to increase their military budgets. "We are taking legitimate steps to reinforce our support to Allies, from the Baltic to the Black Sea," Xinhua quoted Rasmussen, who paid a day-long visit to Bulgaria, as saying in a joint press conference with the country's Foreign Minister Kristian Vigenin. NATO has stepped up practical and political support to Ukraine, to bolster its defense capacity within the framework of their partnership, he said. "We are reaching out to Moldova, Georgia and other long-standing partners across the region to strengthen our cooperation," Rasmussen said. "Bulgaria has a key role in the region, and this region is key to NATO." NATO made clear to Russia that "this can no longer be business as usual," while keeping open the diplomatic channels of communication, he added.